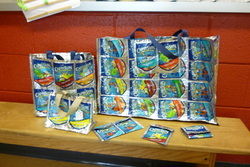 Bags & wallets made from juice pouches by Oxbow students! Oxbow Middle & High School students began making bags, wallets and other cool stuff out of juice pouches this spring (2011) in their Consumer Sciences classes. They have teamed up with Bradford Elementary School and Barre City Elementary Middle School to collect the pouches and make them into new products that may be sold in the school stores. Many schools have made the switch from plastic utensils, paper plates and Styrofoam soup bowls to reusable trays and bowls and metal silverware. Although the cost up front may seem significant, over time the school will not only save money, but save landfill space and natural resources as well.